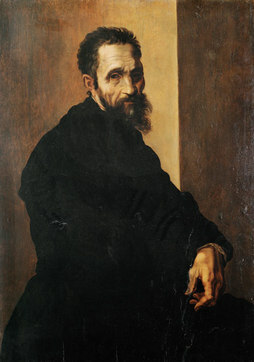 Michelangelo was possibly the greatest artist of the Italian Renaissance. 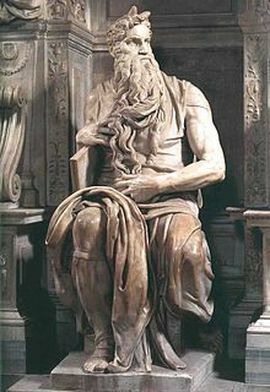 Like Leonardo da Vinci, Michelangelo was talented in multiple areas, such as painting, poetry, engineering, and architecture. 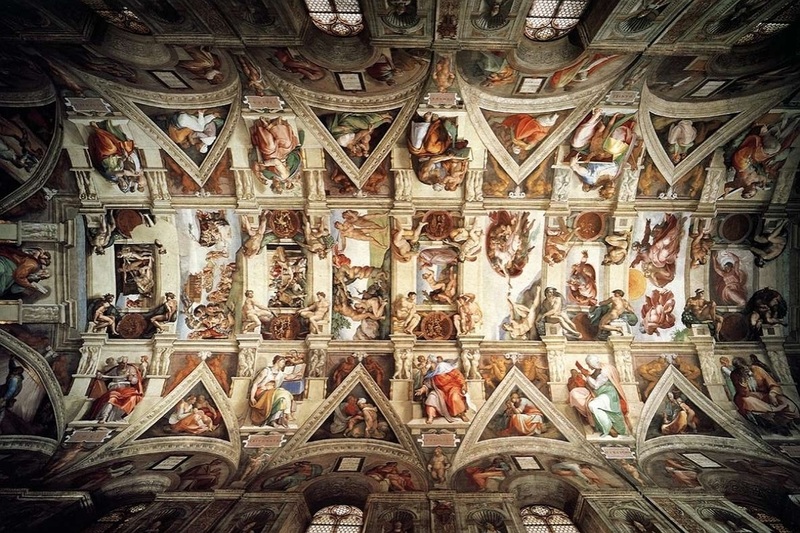 Inside the Vatican’s Sistine Chapel, Michelangelo created two of the most important frescoes of the art world: the scenes from Genesis on the Chapel’s ceiling and The Last Judgment on its altar wall. 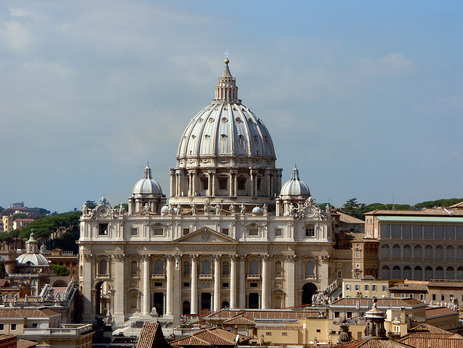 Michelangelo designed the famous St. Peter’s Basilica in the Vatican. 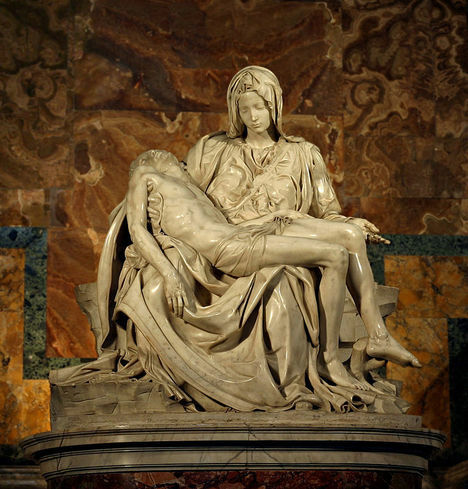 His passion, however, was sculpture, and Michelangelo produced some of the most admired statues in the world. 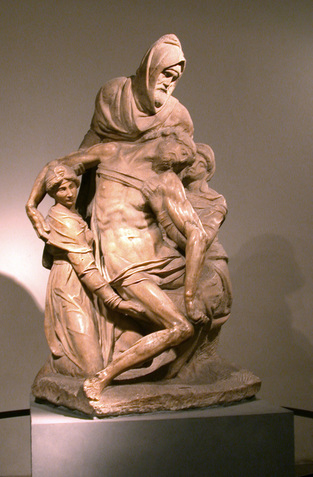 Our artwork of the week is the Pieta sculpture by Michelangelo. Even though Michelangelo was a brilliant painter, as proven by his frescoes of the Sistine Chapel, he considered himself to be a sculptor. 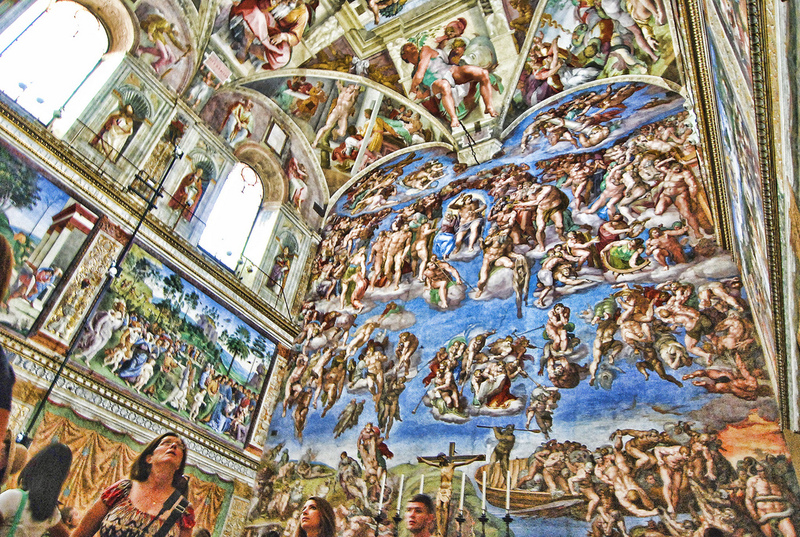 He sculpted pieces for patrons, such as the famous Medici family of Florence, and for Cardinals and Popes of the Roman Catholic Church. Michelangelo was just 25 years old when he sculpted his Pieta from a single piece of Carrara marble. 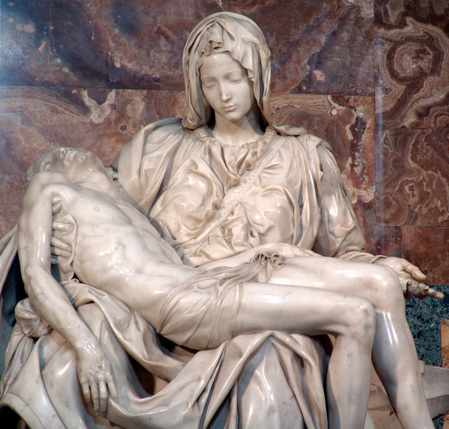 The word Pieta means pity or compassion. The statue is one of the most admired in the world. The positions of the subjects and the realism of the fabric and skin are some of the reasons the statue fills spectators with awe. 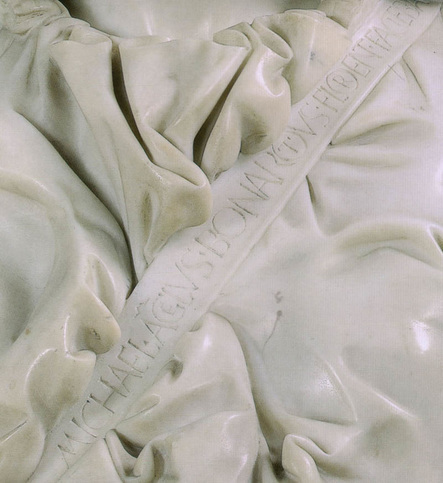 Michelangelo’s signature is across the sash of Mary’s chest and is the only work he ever signed. 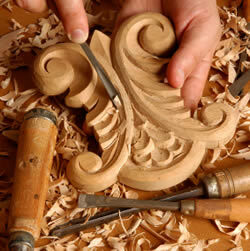 A wood carver cuts away pieces of wood to create the art piece. 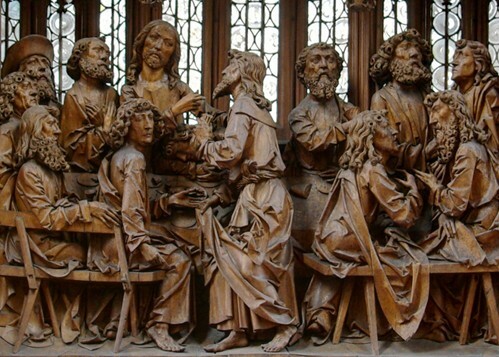 Below, this wood carving in Germany depicts the Last Supper. 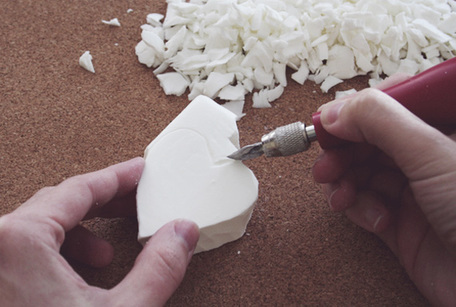 A sculpture is made from a bar of soap by cutting away sections of soap. 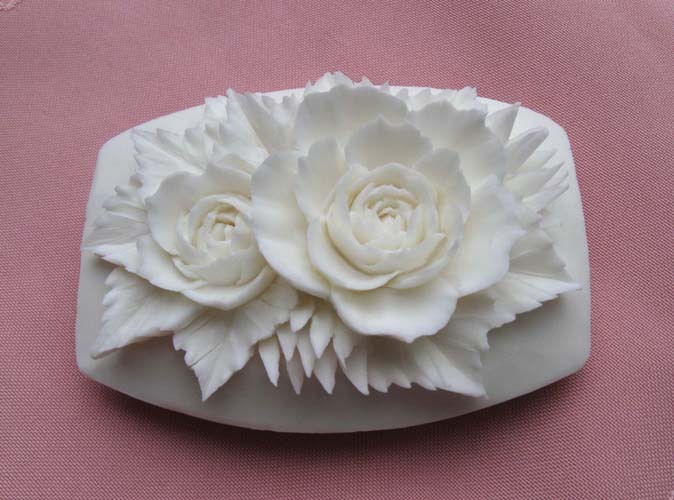 These are examples of soap carving which can be very simple or complex. 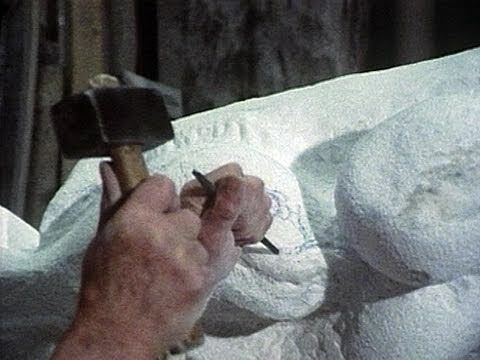 Subtractive sculpture is the most technically difficult to do. 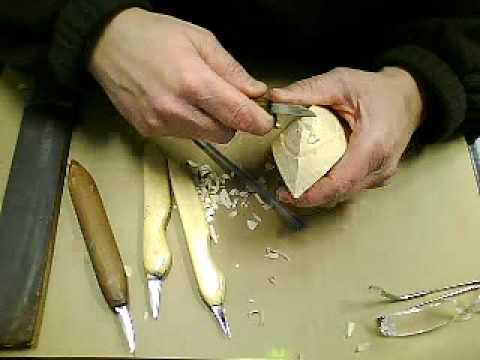 If a sculptor cuts or chips away too much the block of wood or stone can be ruined, and the artist has to start over with another. 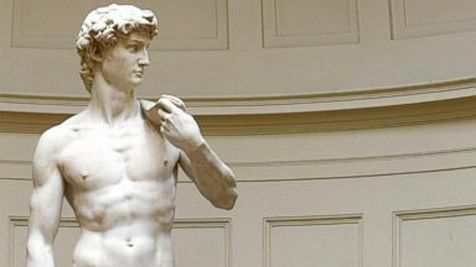 Michelangelo was a subtractive sculptor. 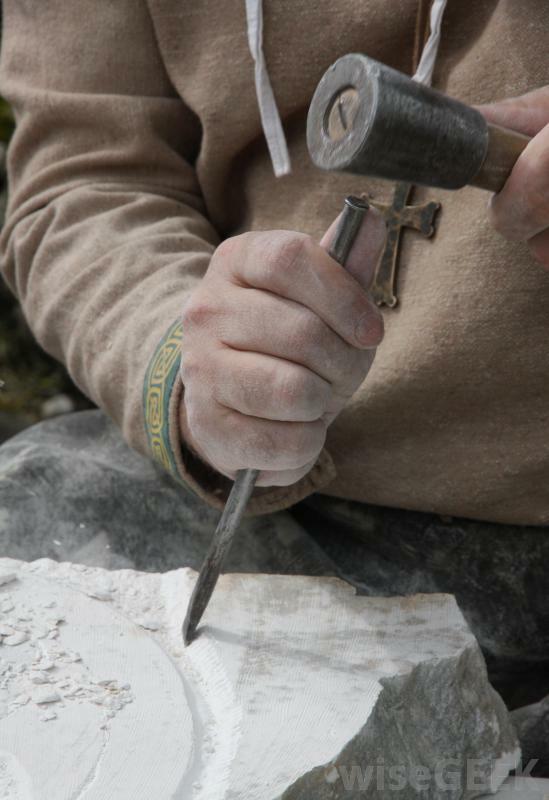 He used a mallet and chisels and other tools to free a figure from the marble block. 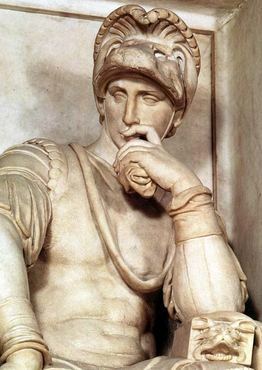 Michelangelo was so dedicated to his work that he would sculpt at night by attaching candles to his hat. Additive sculpture is made by shaping and building up, often around a frame. 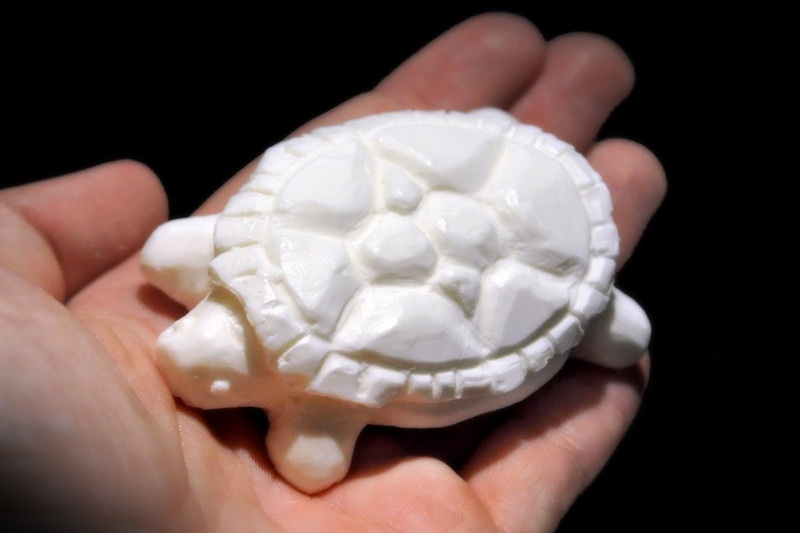 Modeling with a soft material such as clay is additive sculpting. 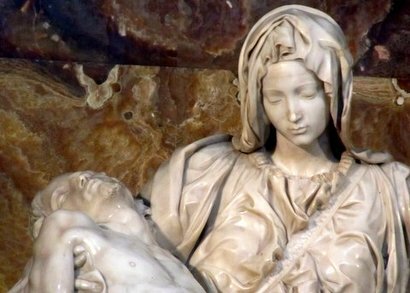 Bernini was a much admired sculptor from the Baroque period. 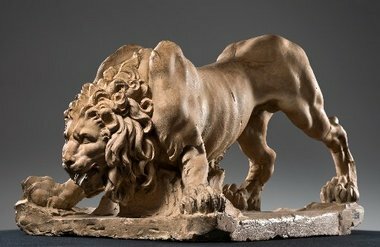 His Lion was modeled in clay as a study for a marble fountain in Rome. A bust is a statue of a person from the shoulders up. 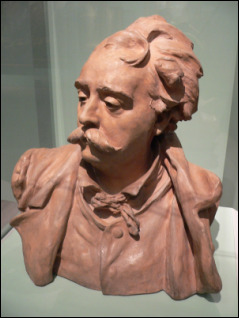 This bust was modeled in clay by a famous French sculptor, Rodin. 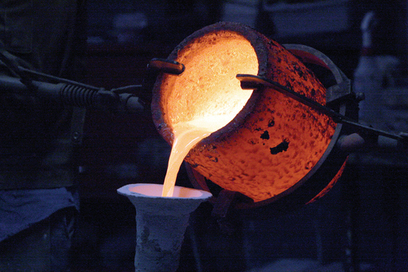 Cast sculptures are made by melting a metal such as bronze and pouring it into a mold. 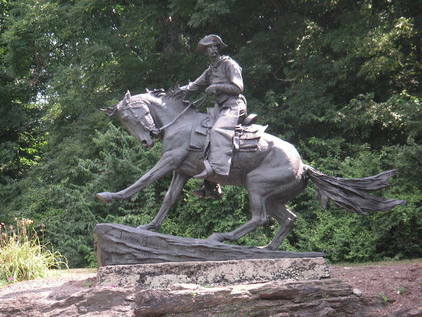 Frederick Remington, one of our Artists of the Week last year, created a bronze cast statue that is displayed in a Philadelphia park. Assemblage is a form of additive sculpture. 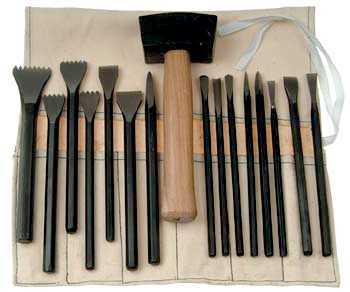 It get its name from the word “assemble” which means to gather together. 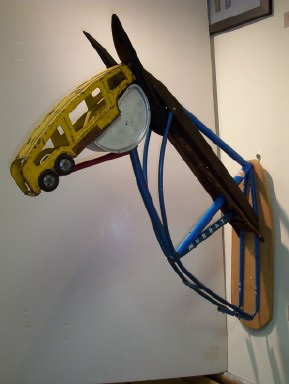 Assemblage sculptures are made by putting found objects together. Instead of disguising the found objects, the sculpture usually shows them in a new light or creates a new form. 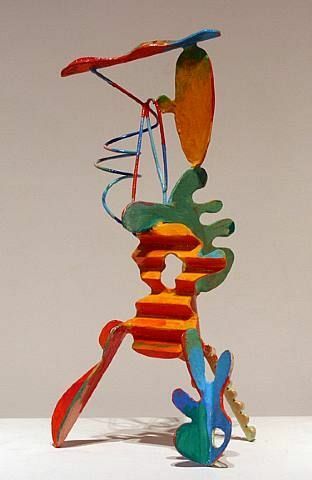 Picasso made assemblage sculptures. 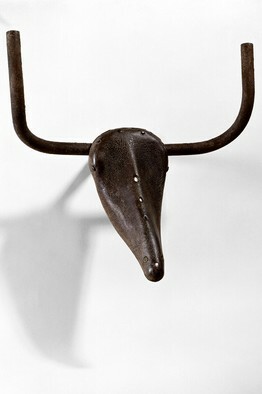 His Bull’s Head is made from bicycle parts. 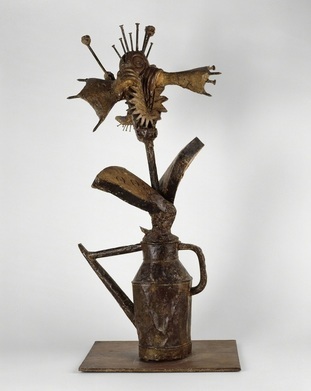 This assemblage sculpture by Picasso is called Flowery Watering Can. 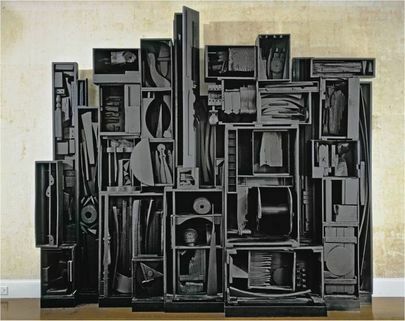 American sculptor Louise Nevelson created many assemblage sculptures. 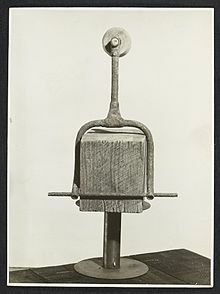 Nevelson called herself “the original recycler”. 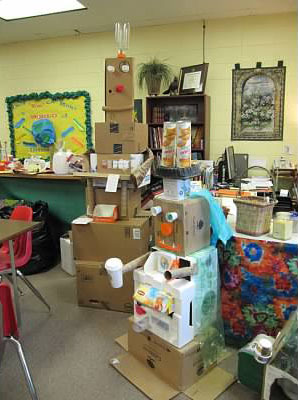 Mrs. Little’s classes’ trash art sculptures are examples of assemblage sculpture. 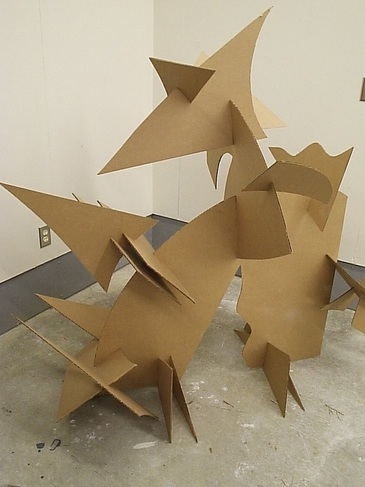 (Above) Create sculptures from cardboard slotted to fit together. Biography.com,. N. p., 2015. Web. 23 Nov. 2015. Getty.edu,. 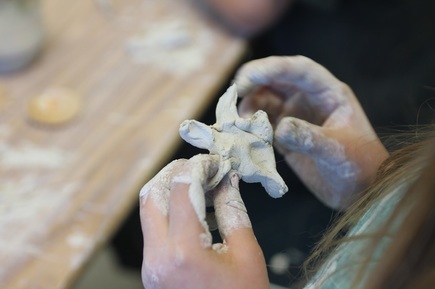 'Working With Sculpture (Education At The Getty)'. N. p., 2015. Web. 18 Nov. 2015. Wikipedia,. 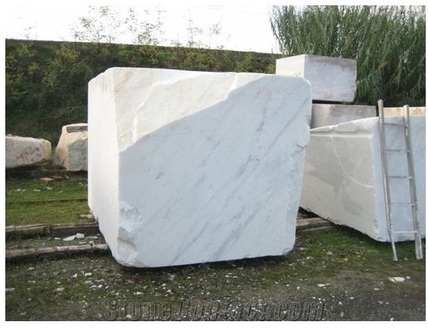 'Michelangelo'. N. p., 2015. Web. 23 Nov. 2015.